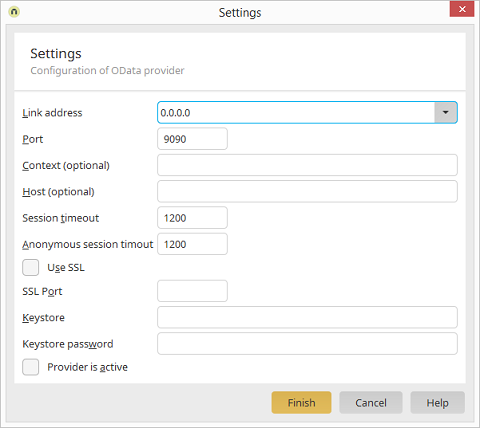 The connection address defines who is allowed to access the OData service. If "localhost" is selected, the service can only be reached from the local computer. You may also select all (IPv4), all (IPv6), or manually enter a specific IP address. Select "localhost" if you only want to test your OData service locally. The port defines the TCP port at which the OData service can be reached. Ideally, you should use a port number between 49152 and 65535, one of the so-called private ports. These can be used variably, since they are not registered and do not belong to a specific application. Host and port together constitute the endpoint URL, at which your service will be reachable. The service can also simply integrated into your domain for public use. Please make sure that you do not use the same port as is used by the Portal Server, and that the port is not already in use by any other application. You may specify a context here, which will be used as part of the service endpoint URL. This may be useful to run services behind a reverse proxy. The context name must conform to URL standards. The endpoint URL will be constructed as follows when a context is specified: http://hostname:port/context/service.svc. A host name can be specified optionally here, when the host name of the public service URL is different from the host name of the server. This may be useful to run services behind a reverse proxy. This option allows SSL encryption to be activated. A keystore is required for SSL connections, which stores the certificates. Specify the file name of the keystore here. The keystore file must be located in the portal directory\internal\cfg\odata\producer. Specify the password for the keystore here. Activates or deactivates the OData Provider. The Provider is deactivated in the default configuration. After activation, the services are started automatically.